During atherosclerosis, smooth muscle cells (SMCs) accumulate into the intima and undergo phenotypic changes. In pig and human, we isolated SMC subpopulations that exhibit features of the synthetic phenotype, typical of intimal SMCs (high proliferative and migratory activities and low level of differentiation). By means of a proteomic approach, we identified markers typical of the synthetic phenotype and explore their role in the phenotypic SMC modulation. 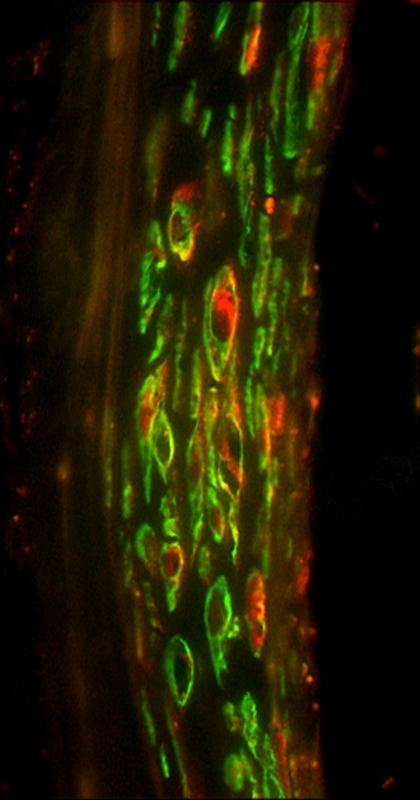 From the porcine coronary artery we isolated two distinct SMC populations, spindle-shaped (S) and rhomboid (R). R-SMCs were recovered in higher proportion from stent-induced intimal thickening and exhibited biological features that explained their capacity of accumulating in the intima. We identified S100A4, a Ca2+-binding protein, as being a marker of the R-SMC population in vitro and of intimal SMCs, both in pig and man. 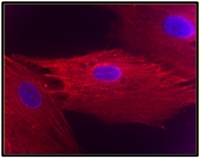 S100A4 exhibits intra- and extracellular functions. We have recently demonstrated that extracellular S100A4 plays a key role in phenotypic and biological changes of porcine coronary artery S- and R-SMC populations probably via the receptor for advanced glycation end products (RAGE). We are investigating signaling pathways and genes involved in S100A4-induced SMC phenotypic transition by means of microarray analysis. A better understanding of S100A4 expression, release and regulation in SMCs could help to shed light on the mechanisms of SMC accumulation in the intima.